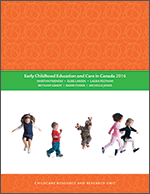 This BRIEFing NOTE summarizes the recommendations provided in the OECD Thematic Review of ECEC: Canada Country Note. Canada was the seventeenth country to be visited as part of the OECD (Organisation for Economic Co-operation and Development) Thematic Review of ECEC. Prior to the visit, a Background Report on ECEC policy in Canada was prepared by Gillian Doherty, Martha Friendly and Jane Beach. After analysis of the Background Report, a review team consisting of an OECD Secretariat member and three experts with diverse analytic and policy backgrounds visited Canada between September 21 - October 3, 2003. The Country Note was published on October 25, 2004. The Country Note discusses issues observed, and suggests solutions and recommendations for the consideration of the competent authorities. The full Canada Background Report and Country Note, as well as many other useful resources related to the Thematic Review, are available online on the OECD web site.